Maryland Pink and Green: Ribbon Outlet Report! The Offray ribbon outlet is located just beside the factory in Hagerstown, MD. It's about an hour and a half drive from Baltimore or DC and is so worth a trip! 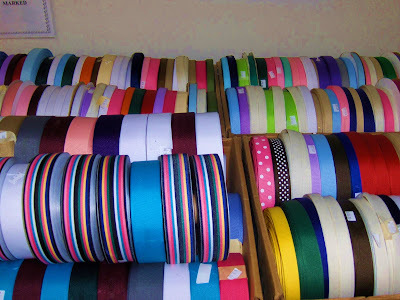 Leesa had mentioned the store to me a while ago and I decided to make the journey to ribbon heaven. To say that I was a kid in a candy store is to put it mildly. 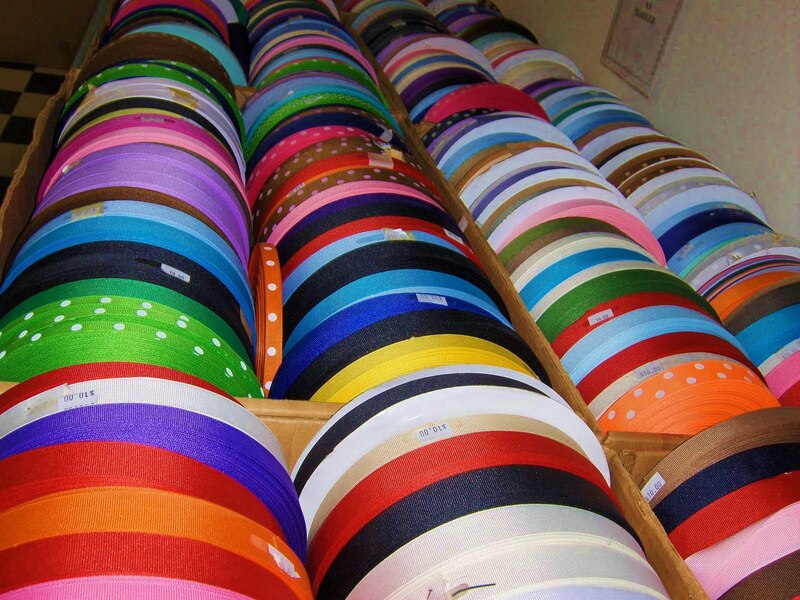 There was ribbon stacked as far as the eye could see. Double sided satin, grosgrain, and velvet ribbons in all colors and sizes wrapped into huge wheels are a delight to the eyes. Literally, I didn't know where to start. 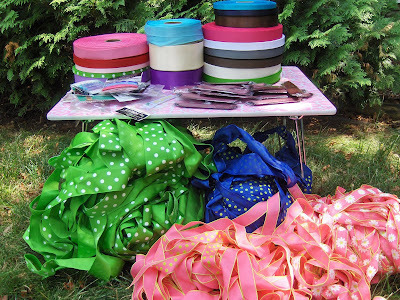 So I began where any good pink and green girl would begin ~ with the grosgrain! The prices for ribbon are an incredible bargain ranging from $1 to $10. The most expensive, largest roll of ribbon I saw was about the diameter of a pizza and cost $10! How gorgeous are these rolls of ribbon?? The prices on the ribbon are so reasonable because the colors are discontinued. There is also another section with "seconds" or slightly irregular ribbon at bargain prices. 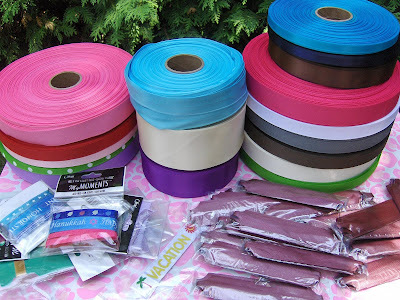 A huge grocery store bag of multiple shades of ribbon costs $1. Other bags about the size of a ziploc bag cost 25 cents! For my peeps who like to make scrapbooks, there are many self-adhesive ribbons and other embellishments for paper, cards, and scrapbooks. Natalia and Alexia think that I should open a "bow business!" During the fall, I'd love to return to the Offray outlet to stock up on some ribbon for Christmas. Let me know if you'd like to join me. It would be a fun girls' day out! Visit the Offray Ribbon Outlet at 857 Willow Circle in Hagerstown, Maryland. Oh my! I would have been in HEAVEN!!! Thanks for sharing pics from your visit. I was I lived closer and could go myself! I have a bow business and I'd be in 7th Heaven there!!! Oh! I am in heaven!!! I must go there. I used to do craft shows and sell ribbons for little girls:) Have fun!!! I would do serious damage in that store!! How fun! What a fun trip!! I too have a weakness for ribbon. I'd love to join you on your next trip if only I lived closer. :) Hope you post a follow up on all the wonderful things you make with it. Love this! Makes me want to take a road trip!! for ribbon! Wow! How fun! I wish there was an outlet like that near me! So fun to look at! Looks like you got some real bargains. Congratulations! You DEFINITELY need to go back for Christmas stuff! Maybe make cute bow wreaths? Congrats on all of your purchases! I lived in DC for more than 3 years and never knew about this place. OMG it looks beyond fabulous! I wish I lived closer!! I would go absoulutely crazy there! I just keep thinking about all the adorable ribbon topiary balls you could make. OH.MY.GWAD!!!! I'd be in heaven...HEAVEN I TELL YA!!! What fun and how cheap!! I would have bought out the store!! I'll have to remember this place next time I'm out that way, thanks!